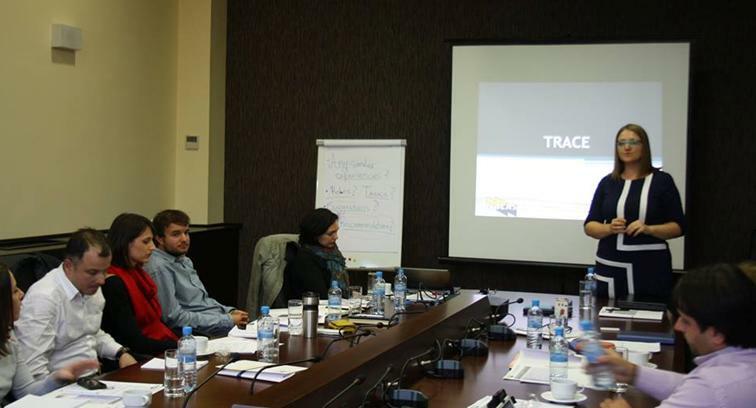 Teams of course coordinators, facilitators and IT support met today, 27 October 2014 in Skopje, Macedonia to learn more about NALAS e-Academy, discuss the details of the testing phase and clarify roles and responsibilities. This was done in light of the launching of the testing of the first three e-learning courses, focusing on Street Addressing and Management of Cities, Sustainable Land Use Planning and the Use of the Tool for Rapid Assessment of City Energy. The courses were originally developed by the World Bank Institute, and NALAS, as their partner for South-East Europe adapted the courses for use in the region and translated them in local languages. In the testing phase, the courses will be delivered in partnership with the NALAS member local government associations from Albania, Kosovo and Macedonia: the Albanian Association of Communes, the Albanian Association of Municipalities, the Association of Kosovo Municipalities and the Association of Local Self-Governments in the Republic of Macedonia. The testing phase starts on 3 November and will last until the end of the year. NALAS e-Academy aims to bring NALAS Knowledge Centre to a higher level, by providing an integrated system for e-learning for SEE local governments, that contributes to modernization of local public services, improving the quality of services and increasing the level of professionalism of local government administration throughout SEE. The courses offered by NALAS are offering first class content, enriched with number of case-studies from the region and beyond, the learning process is done with the use of modern learning tools, facilitated by experts in the topic and the knowledge gained can me immediately applied at the working place. "E-learning is the future of the professional development in municipalities. We believe in this and can't wait to see the first results", said the first NALAS e-learning team. We express our gratitude to the World Bank for their support in all phases of the development of NALAS e-Academy. We are looking forward to our future collaboration! On 11 and 12 April, the City to City Dialogue Conference: “Cities as Drivers of Economic Growth – Vision 2030” took place in Skopje and Veles, Republic of North Macedonia. The conference explored the role of cities and municipalities in the economic development agenda, how it can be enhanced for the benefit of the citizens of South-East Europe and what are the best practices that cities can learn from. EU Commissioner Johannes Hahn addresses the audience of the City to City Dialogue Conference - Cities as Drivers of Economic Growth - Vision 2030 (Video message). On April 12th, 2019 EU-Commissioner for European Neighbourhood & Enlargement Negotiations Johannes Hahn delivered a video message during the City to City Dialogue Conference - Cities as Drivers of Economic Growth - Vision 2030. The Commissioner stated that "strengthening of the cities for the Regional Economic Area is vital to stop brain drain and turn it into brain circulation". Watch the full video message below. The 14th NALAS General Assembly - Economic growth only possible with the active role of the local government. On April 11, 2019, the 14th NALAS General Assembly took place in the City of Skopje, while bringing together over 70 Mayors, municipal experts and local government associations from the 12 member countries from the SEE Region. If you wish to regularly receive LGA and LG updates through NALAS Digest, please sign in with your e-mail address. © 2014 NALAS. All rights reserved. Designed by 4WARD.